Welcome to Snappy Tomato Pizza. This page (together with the documents referred to on it) contains the terms and conditions on which our independent owner operators (the "Snappy Tomato Pizza Franchisees") supply products to you, whether in store or by phone, via our websites (www.snapppytomatopizza.co.uk) and via our mobile, tablet or other applications (our "Sites"). If you have any questions relating to these terms and conditions please use our Contact Us link before you place an order. Please note that messages via this link will only be read during normal office hours, thank you. If you do not accept these terms and conditions please exit our site. Our Sites are operated by Snappy Tomato Pizza Ltd, registered in England and Wales, Company No: 2854777 with our registered office at 1 Warner House, Harrovian Business Village, Bessborough Road, Harrow. HA1 3EX. Correspondence Address, 91 Heming Road, Redditch, Worcestershire. B98 0EA. Snappy Tomato Pizza is a franchised business, where all stores are owned and operated by independent Franchisees, trading as Snappy Tomato Pizza ("Snappy Tomato Pizza Franchisees"). Our Sites are operated by Snappy Tomato Pizza Ltd on behalf of our Franchisees. Every Snappy Tomato Pizza Franchisee is independently responsible for legal and regulatory compliance and for the operation of its own store(s) and all compliance and any other issues arising from any transactions or arrangements with you. This means that each Franchisee is solely responsible and liable for all products you purchase from them whether via our Sites or in store. All orders placed through our sites are accepted by us as agent on behalf of our Franchisees and the resulting legal contract is between you and the Snappy Tomato Pizza Franchisee that operates the Store providing your order. Your order is subject to these terms and conditions. The purpose of our site is to provide a simple and convenient service to our Snappy Tomato Pizza fans, linking them to their nearest Snappy Tomato Pizza Franchised store. Our interactive menus allow you to build and submit your orders in a clear, informative and easy to use format. Snappy Tomato Pizza stores all have a defined territory. There are three levels of service available. Within a defined area in a reasonable distance from the store based on a combination of drive time and distance some stores offer a choice of free delivery or collection. The next level, offers a pre-defined paid for delivery area with, again the choice of collection from the store and finally we define an area where it is not feasible to offer a delivery service but you can order for collection from the store. These areas are defined by postcode so when you enter your postcode you will be advised if you are not in the Free Delivery Area and how much it will cost for delivery to your address and if you are outside the delivery areas you will be advised that we can only accept orders for Collection from the store. When you first enter your postcode the home page for your local store will show the details of opening hours and last time for delivery orders. For the safety of our drivers, unless specific arrangements have been agreed with the store in advance, a driver will only deliver to the main door/reception when delivering to apartment blocks, flats or hotels. After placing an order on our Sites, you will be presented with a screen thanking you for your order. Depending on the preferences you have selected you will then receive a 'Thank you for your Order' email and/or push* message to your mobile device to confirm that your order has been sent to your local store. Please take the opportunity to check that all the details on the confirmation are correct, paying particular attention to the Delivery Address, Telephone Number and the items listed in your order. It is your responsibility to ensure that the email address, home address and telephone number provided are correct, are in working order and are available to be read and/or answered during the time from when your order is placed to the time it is either delivered to you or you collect from the store. We cannot accept responsibility for any delays or problems with your order if we are not able to contact you using the telephone number you have provided. When the store accepts your order you will receive a second 'Order Confirmation' email/push* message confirming your order has been received and accepted by your local Snappy Tomato Pizza store. The contract will be between you and the Snappy Tomato Pizza Franchisee and will only be formed when you have been sent the email confirming your order has been received and accepted by your local Snappy Tomato Pizza store. This is why it is important to ensure that your email address is correct and that your mailbox is working and that the contact telephone number you have provided is also correct and your device is switched on and connected correctly. Please note that incorrect personal details may lead to problems with your order or delays in delivery, so please ensure that you have included your correct address (including postcode), email address and contact telephone number when registering your details. Please understand that the 'Thank you for your order' and 'Order Confirmation' emails are generated electronically - please do not reply to these emails as they cannot be read or acted upon. If you have any urgent queries resulting from the 'Thank you for your order' email or 'Order Confirmation' email, please telephone your local store to advise and agree any changes that may be required. All food preparation and deliveries are the sole responsibility of the Snappy Tomato Pizza Franchisee accepting the order. All Snappy Tomato Pizza Franchisees are committed to providing a quality service, however Snappy Tomato Pizza Ltd accepts no responsibility or liability for the quality or quantity of any goods delivered by or collected from a Snappy Tomato Pizza Franchisee. However, it is very important to us that all our Franchisees ensure that their stores work to maintain our hard won reputation for quality, value and service so if you have any comments, complaints or praise in respect of any of our stores we would very much like to hear from you. Please use our Contact Us link. Such is our commitment to maintaining our high standards of quality, value and service that all messages sent via the Contact Us link are seen by the company's Managing Director. We work hard with all our Franchisees and their staff to maintain their commitment to high standards of menu quality and customer service but we know that sometimes mistakes can happen and we do want to make things right for you. In the unlikely event that you are not happy with your order it is very important that you contact your local store immediately. In almost all cases the store will be able to resolve your concerns straight away. If the team in store have not been able to resolve the problem for you then please use the 'Contact Us' link on our website and app but please be aware that Contact us messages are sent to Snappy's Customer Service Team at Head Office. Messages sent using this 'contact us' link will only be read in normal office hours, Monday to Friday 9am to 5pm excluding bank holidays so your local store will be able to give a faster and more immediate solution. If you use the Sites to place an order with your local store before the store is open you will be advised that you are placing an 'Advance Order'. This means that you will receive the first 'Thank you for your Order' email/push* message as described above but the 'Order Confirmation' email/push* message will not be sent until the store opens and the staff in store can check that your order can be fulfilled. In the unlikely event that you do not receive the 'Order Confirmation' email/push* message please contact the store to check that the order has been received. All Menu Items are subject to availability. In most cases, your local Snappy Tomato Pizza store will offer an alternative for any out-of-stock item. We do not use nuts in our pizzas or side orders, however, some ingredients are produced in factories that handle nuts and some ice creams contain nuts. For full ingredient lists, nutritional and allergen information see our Food Guide. Due to local supply arrangements for Burgers, Kebabs and other 'Extras Menu' items we are not currently able to list all ingredient, nutrition and Allergen information for the ingredients used in the preparation of these 'Extras Menu' Items - if you have any food intollerances, especially related to Gluten, Dairy, Nuts, Peanuts, Sesame Seeds, Mustard, Eggs, Fish, Celery, Lupin, Soya or Sulphur Dioxide, please call your local store before ordering any items from the Extras Menu Range which includes any Burgers, Kebabs, Wraps, Fish and Chips, Fried Chicken etc. Our Stores are busy working environments and there is a risk of cross-contamination between toppings. If you have an allergy we kindly ask that you do not order online. In this scenario, please telephone your chosen Store and inform your order-taker at the Store of your allergies directly. Menu items suitable for Vegetarians are indicated with a 'V' in each menu section. In conclusion - If you suffer any allergy to ingredients used by Snappy Tomato Pizza, even if they are not included on your order, please do not order online. Please call your nearest store directly to place your order and explain the nature of your allergy in full to a member of staff. Some stores provide a range of Halal toppings and in such cases, ingredients described as Ham* will be made from Non Pork meat such as Turkey or Chicken, certified as Halal. Such ingredients will be marked with an * as described as 'Non Pork Product'. Our goal is to provide the best pizza delivery service in your area which includes an excellent reputation for on-time delivery i.e. delivering pizza at the time we quote. Unfortunately things do not always go to plan and factors, such as weather and traffic conditions, may occasionally prevent us from achieving this. We will do our best to fulfil your order in accordance with the delivery time set out in the confirmation email or, if delivery is specified as asap, then within a reasonable time from the time the confirmation email was sent taking into account the number of orders and the circumstances being faced by the Snappy Tomato Pizza store at that time. We will do our best to inform you if we become aware of an unexpected delay. In order to maintain our target for an efficient and timely delivery service we work very quickly to commence the preparation of your order so it can be very costly to cancel an order once we have confirmed receipt of your order and sent a confirmation email/push* message. If you have an urgent need to cancel your order please telephone the relevant store urgently to check the situation. Please understand that the 'Thank you for your order' and 'Order Confirmation' emails/push* messages are generated electronically - please do not reply to these emails/push* messages as they cannot be read. Please be aware that it may not be possible to cancel the order once we have started to make the menu items you have ordered. The Snappy Tomato Pizza Franchisee will have the final decision on whether an order can be cancelled depending on how far the make process has progressed. If the order cannot be cancelled the charge will be confirmed and no refund will be due. An order may be cancelled by a Snappy Tomato Pizza Franchisee in his/her/its sole discretion after you have been presented with the Confirmation Screen. Snappy Tomato Pizza Ltd and the Snappy Tomato Pizza Franchisee reserve the right to cancel any order, before or after acceptance, and will notify you immediately of any such cancellation. You will not be charged for cancelled orders made in accordance with these cancellation provisions. Any payment made prior to an order being cancelled by Snappy Tomato Pizza Ltd or a Snappy Tomato Pizza Franchisee will usually be reimbursed using the same method originally used by you to pay for your purchase. The price of all menu items will be as quoted on our website and may vary from time to time, except in cases of obvious error. Prices include VAT where applicable. Prices will vary between stores. Prices are liable to change at any time, but changes will not affect orders in respect of which you have been presented with the Confirmation Screen. Despite our best efforts, some of the Menu Items listed on our site may be incorrectly priced. The Store will normally verify prices as part of the order process. Payment for all Menu items can be by credit or debit card at the point of ordering or in cash at the point of collection or delivery. We accept payment via Maestro, Visa Delta, Visa and MasterCard. Your credit or debit card will be charged when you confirm payment at completion of the online order process. Payments by Debit/Credit Card for orders placed on the Sites using the NetPay Gateway are sent directly to the Snappy Tomato Pizza Franchisee after the Payment Gateway and Merchant Acquirer have received payment from your card provider. Payments using the PayPal option for orders placed on the Sites are made directly to Snappy Tomato Pizza Ltd and subsequently passed to the Snappy Tomato Pizza Franchisee. Payments for orders placed in store are made directly to the Snappy Tomato Pizza Franchisee. Refunds of Payments made using the NetPay or PayPal payment Gateways can only be made by Snappy Tomato PIzza Ltd and only after receiving authorisation from the Franchisee. Under normal circumstances any refund authorised by the Franchisee will be made during normal office hours (9.00am to 5.00pm) on the next Business Banking Day - Monday to Friday. Any Refunds authorised will be made using the same method originally used by you to pay for your order. To the extent permitted by law, Snappy Tomato Pizza provides makes no representation or warranty of any kind, express or implied, regarding the content or availability of our site, or that it will be timely or error-free, that defects will be corrected, or that our site or server that makes it available are free of viruses or other harmful components. 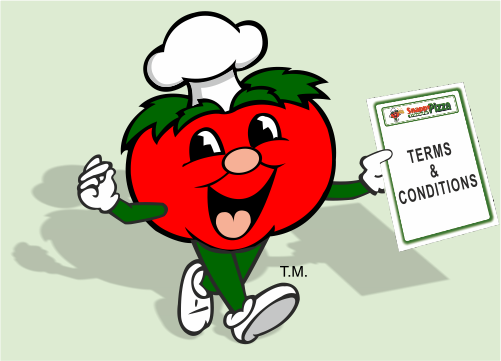 Subject to the previous paragraph, neither Snappy Tomato Pizza Ltd nor Snappy Tomato Pizza Ltd's directors, officers, agents, employees or contractors shall have any liability for any direct, indirect, special or consequential losses or damages (including without limitation, damages for loss of business or loss of profits), arising in contract, tort or otherwise from the use or inability to use our site. The liability of any Snappy Tomato Pizza Franchisee for losses you suffer as a result of a Snappy Tomato Pizza Franchisee breaking the contract, including deliberate breaches, is strictly limited to the purchase price of the Menu Item(s) you order. Applicable laws require that some of the information or communications we send to you should be in writing. When using our Sites, you agree that communication with us will be mainly electronic. We will contact you by e-mail/push* message or provide you with information by posting notices on our website. You agree to this electronic means of communication and you acknowledge that all contracts, notices, information and other communications that we provide to you electronically comply with any legal requirement that such communications be in writing. This condition does not affect your statutory rights. Snappy Tomato Pizza Ltd and the Snappy Tomato Pizza Franchisees will not be liable or responsible for any failure to perform, or delay in performance of, any of our obligations under a contract that is caused by events outside our reasonable control (a "Force Majeure Event"). If Snappy Tomato Pizza Ltd or any Snappy Tomato Pizza Franchisee shall fail, at any time during the term of a contract, to insist upon strict performance of any of your obligations under the contract or any of these terms and conditions, or if Snappy Tomato Pizza Ltd or any Snappy Tomato Pizza Franchisee fails to exercise any of the rights or remedies to which we are entitled under the contract, this shall not constitute a waiver of such rights or remedies and shall not relieve you from compliance with such obligations. A waiver by Snappy Tomato Pizza Ltd or any Snappy Tomato Pizza Franchisee of any default shall not constitute a waiver of any subsequent default. No waiver by Snappy Tomato Pizza Ltd or any Snappy Tomato Pizza Franchisee of any of these terms and conditions shall be effective unless it is expressly stated to be a waiver and is communicated to you in writing (email correspondence will be permitted). These terms and conditions and any document expressly referred to in them represent the entire agreement in relation to the subject matter of any contract and supersede any prior agreement, understanding or arrangement between us and our Franchisees, whether spoken or in writing. Contracts for the purchase of Menu Items through our site and any dispute or claim arising out of or in connection with them or their subject matter or formation (including non-contractual disputes or claims) will be governed by English law. Any dispute or claim arising out of or in connection with such contracts or their formation (including non-contractual disputes or claims) shall be subject to the non-exclusive jurisdiction of the courts of England and Wales.